Today, NPR posted… of all things… a review of the album that was a turning point in my life. 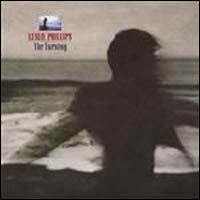 The Turning, by Leslie Phillips (now Sam Phillips), continues to win praise for its excellence and vision twenty years after its release, whereas most albums from the contemporary Christian music market never get much notice outside of Christian circles, and are all but forgotten even within those boundaries ten years later. And her work continues to grow, deepen, and move in mysterious ways. Thanks to the watchful Christian Hamaker for bringing this to my attention. That was a good listen, sounded great Jeff. I really appreciated how Kim gave you so much space to thoroughly answer the questions. Not a common practice I’ve heard on talk radio shows. So how was Martin a troublemaker? I was just kidding, Jonathan. It was just funny to be welcomed onto a radio program half a world away and have the one caller who gets through be a good friend from my neighborhood. Not only that, but Martin’s question was quite deliberate. He knows that I was on another radio show last week where, when the same subject came up, the host decided ahead of time that he didn’t like my perspective, so he cut me short, refused to let me complete my thought, and used his control to frame my comments and make me look like some kind of subversive influence. Kim Jeffries, on the other hand, actually delivered on her promise of “welcoming” me as a “guest” to “talk about my book.” This was a pleasant surprise after that other host claimed to “welcome” me as a “guest” and then proceeded to read a bunch of exaggerated accusations and turn me into some kind of target. You don’t feel very welcome when your host prefaces comments with things like, “Now, I don’t just want to beat you up but….” Ahh, the things people say on Christian radio in the name of Jesus…. Yeah, that was the intent behind my question. Just thought Jeffrey deserved a chance to tell his side of certain controversies, to unpack his “philosophy” a bit. So I called up and pitched him a big fat softball. I realize that few if any people who heard Jeffrey interviewed by Radio Host A will connect the dots to the interview by Radio Host B, but even if they don’t, at least Jeffrey’s take on the subject is now on record. If I catch any future radio interviews and people aren’t exactly lighting up the switchboard, I might call in and pitch more softballs.